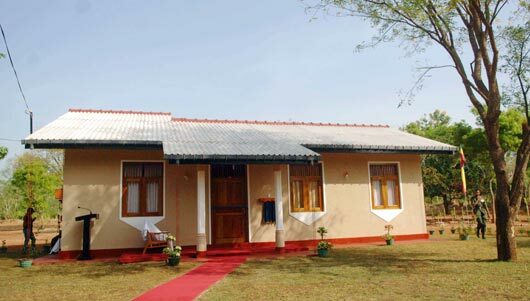 The fourth phase of the Api Wenuven Api Housing Project launched by the Ministry of Defence was ceremonially held in Monaragala and Badulla Districts on 25 June 2011. President Mahinda Rajapaksa graced the occasion as the Chief Guest and handed over the keys of the houses to war veterans. The main ceremony was held at the Ethiliwewa Junior School in Thelulla, Moneragala and the President handed over keys of 31 houses to the recipients at the ceremony. Ministers Sumedha Jayasena, Nimal Siripala de Silva, Jagath Pushpakumara, Lakshman Senevirathne, Vijith Vijithamuni de Soyza, Secretary to the President Lalith Weerathunge, Defence Secretary Gotabaya Rajapaksa, Chief Minister of the Uva Province Shashendra Rajapaksa, Commanders of the tri forces, DIG of Police and family members of the war veterans participated in the ceremony. 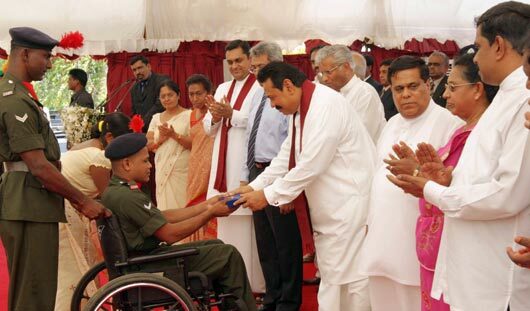 Pictures seen here are the presentation of the ownership of the house by President Rajapaksa to disabled corporal J.K.Vipula Kumara and presents school equipment kits for 106 children of war heroes’ families. 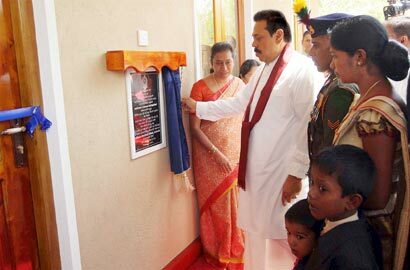 The President also declared open the new house constructed for Army Corporal G.K.Vipula Kumara. The “Api Wenuwen Api” housing project launched by the Ministry of Defence plans to construct 700 housing units island-wide for the war veterans. The fund has constructed these houses for the families of fallen and missing war heroes and disabled and in service soldiers. It is notable that, many Sri Lankans living in abroad, showing their gesture on security forces, have contributed to the “Api Wenuwen Api” housing fund at the request of President Mahinda Rajapaksa and Defence Secretary Gotabaya Rajapaksa.